Minimum 3 to maximum 8 lessons per day; the course intensity may be changed from week to week. —We suggest you choose our private tuition program if you want a course that can be tailored to your particular professional, or personal, or time scheduling requirements. The minimum enrolment period is 5 days, which can be extended according to your needs. These individual courses may start on any weekday of the year. The intensity of 3 to 8 lessons daily can be decided by the participant. Accademia Italiana di Lingua— Our school is a recognized examination centre of the Accademia Italiana di Lingua (AIL), and we organize preparatory courses for all the different Italian "Firenze" examinations of the AIL. At the end of the 1st ability level; One month preparation for beginners; exams 4 times a year. At the end of the 3rd ability level; Three months preparation for beginners; exams 4 times a year. At the end of the 4th ability level; Four months preparation for beginners; exams 4 times a year. At the end of the 6th ability level; Six months preparation for beginners; exams twice a year. At the end of the 6th ability level. Six months preparation for beginners, including business and commerce course; exams twice a year. Ask for the special information brochure for the AIL-exams Firenze. * Levels according to the Assessment Grid of the European Language Portfolio (elp), based on the assessment grid of Schneider/North (s/n). **In order to guarantee every student the corresponding level, the school reserves all rights to halve the course if the minimum number of students will not be reached. This course is specifically designed for more mature students over the age of 50. 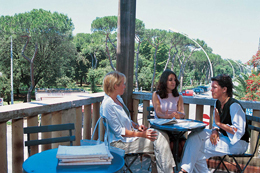 Students will learn italian in a pleasant and relaxing enviroment, accompanied by a wide variety of cultural activities.